There was a person in Isabella’s life whom she loved dearly, but rarely talked about. Her name was Frances Alden. In 1892 Isabella and her husband Gustavus “Ross” Alden were living in Washington, D.C. Ross was the minister of the local Presbyterian Church; their son Raymond was 19 years old and studying not far away at the University of Pennsylvania. Through one means or another Isabella—at the age of 52—became a mother again. She and Ross adopted a baby girl, whom they named Frances. By the time she was three years old, Frances had wintered in Florida, spent summers at Chautauqua, and traveled across the country from coast to coast, all in the company of her adopted mother and father. From The Los Angeles Times, Wednesday, January 1, 1901. Perhaps Isabella’s speeches and magazine articles on the topic of rearing children offered fresh new perspectives because of her experience with Frances. From the Sacramento Daily Union, October 25, 1897. 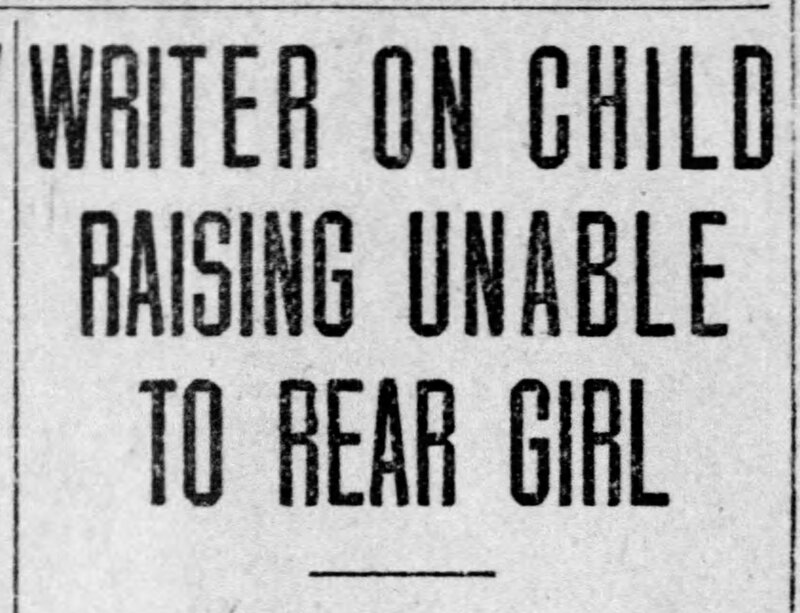 Palo Alto Press, May 21, 1902. Thanks to Isabella’s successful writing career, she and Ross could afford to give Frances every advantage. When they realized Frances had been blessed with a talent for music, they ensure Frances had the best music and voice teachers. By the time Frances entered her teen years, she was an accomplished singer and musician, and often performed in school and at church. The Daily Palo Alto Times, March 9, 1907. She was also acquiring a reputation as a notable beauty; and Isabella and Ross were determined to protect their daughter from flatterers. When Frances was fifteen, they enrolled her at Park College, a small Christian school in Missouri. 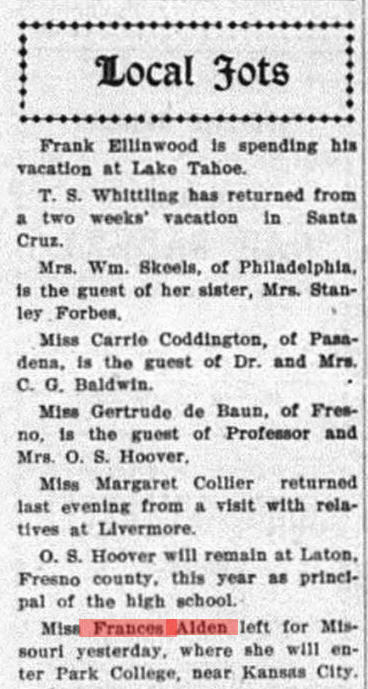 The Daily Palo Alto Times on August 20, 1907. There are no records to account for Frances’ time at Park College; but by the time she turned 18 in 1911, Frances was once again living at home with Isabella and Ross. And she had changed quite a bit. Frances had become either rebellious or something of a prankster; either way her actions resulted in her having to appear in juvenile court at least once. The more Isabella and Ross tried to curb her behavior, the more Frances resisted. In desperation, Isabella and Ross sent her to the Florence Crittenden Home, which was a nationwide network of residential homes that specialized in treating and caring for delinquent teens and unmarried pregnant women. Frances remained at Crittenden for four months. When she returned to the Alden home, Frances decided to enroll at Stanford University, where her brother Raymond was a Professor of English. Her willingness to pursue her education must have been encouraging for Isabella and Ross. Unfortunately, when Frances entered Stanford, she did so dressed in disguise. For three days she masqueraded as a male student on the campus and in the classroom. The discovery of her deceit caused a scandal, and probably caused Raymond quite a bit of embarrassment, as well. Her prank was the last straw for Isabella and Ross. 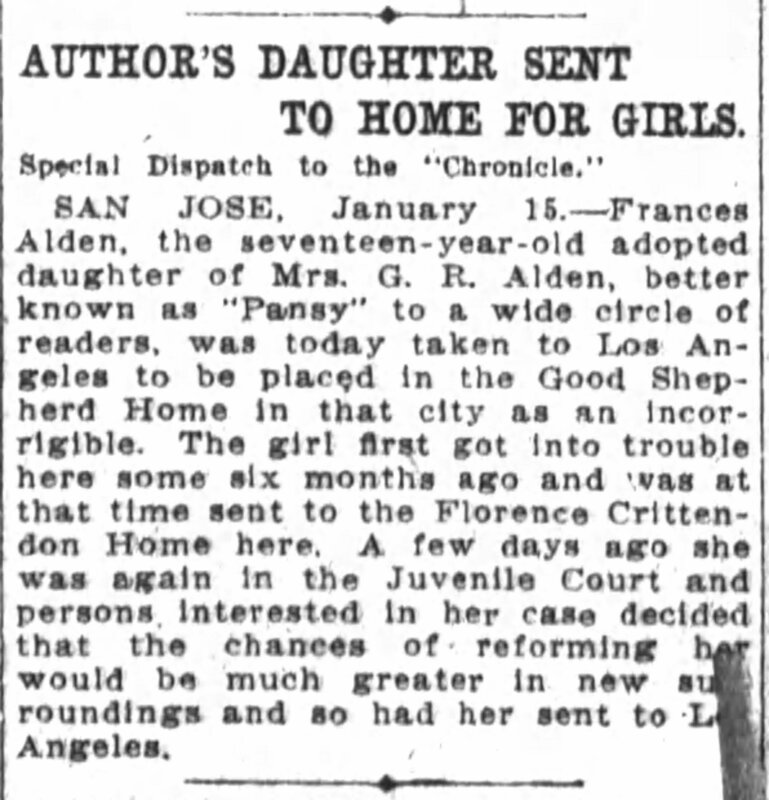 Once again they made the decision to send Frances away, but this time, they decided to send Frances to the Florence Crittenden Home in Los Angeles, 362 miles away. Still rebellious, Frances arrived in Los Angeles, but instead of checking into the Crittenden Home, she went, instead, to the Home of the Good Shepherd, and tried to sign herself in under the name Vera Carter, which she declared to be her real name. As bad as the entire experience was for Isabella, there were even more trying times to come. Somehow, the newspapers caught wind of the situation. Isabella awoke one morning in January 1911 to find her troubles with Frances described in large print in newspapers across the country. 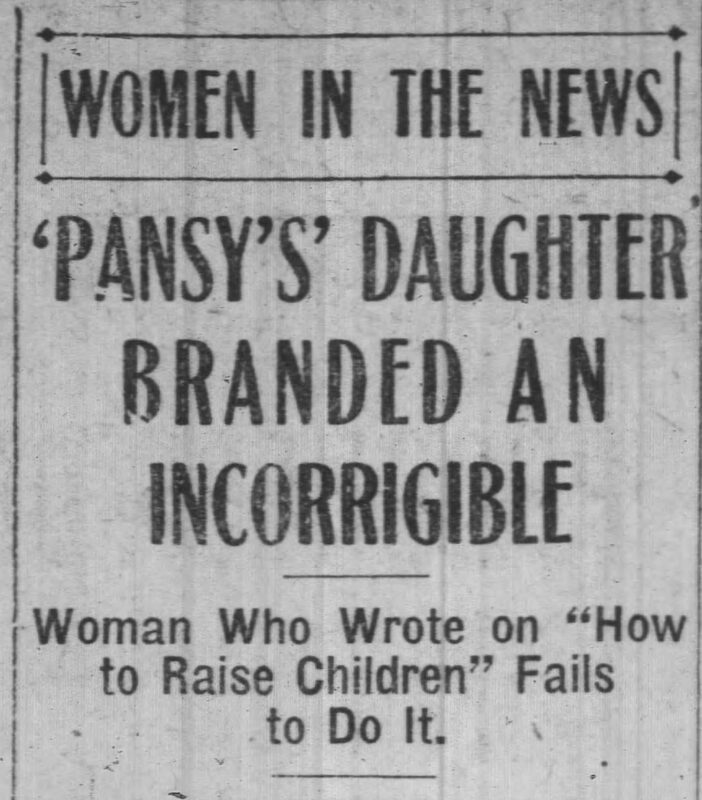 From the San Francisco Chronicle, January 16, 1911. 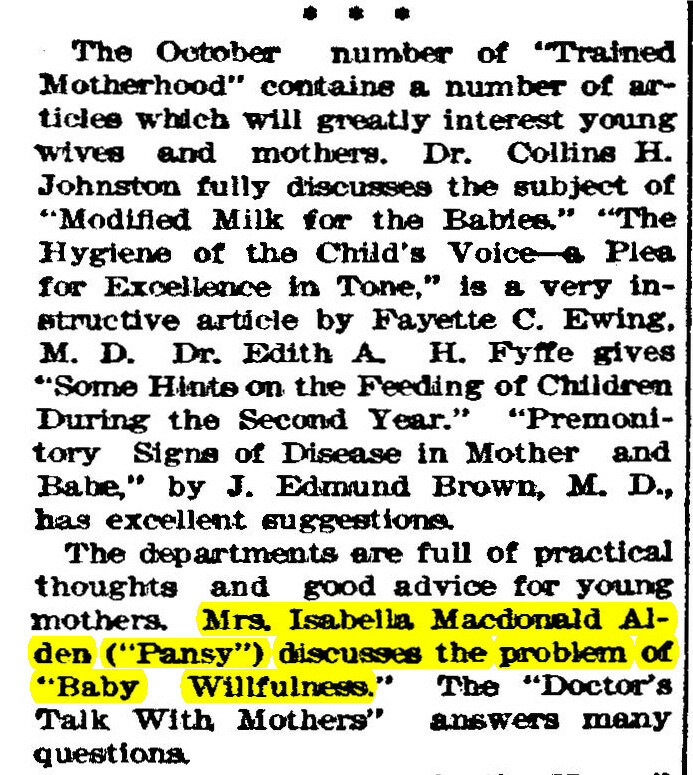 Oakland Tribune, January 16, 1911. How long Frances remained at the Home of the Good Shepherd is unknown, and once again, there are no records to help us understand what happened to Frances next. Records do show that she remained in Los Angeles. In 1923, at the age of 31, she married a man named Bertram Minch. Bert worked for an oil company as a well operator in the oil fields, and later as an engineer for the city of Beverly Hills, California. Frances and Bert remained married until his death in 1963. They never had children of their own. There are no records or newspaper accounts to tell us if Frances and Isabella ever saw each other after Frances entered the Home of the Good Shepherd. It could be that Frances severed all ties with her mother, or perhaps it was Isabella who severed ties with Frances. Either way, in her memoirs, Memories of Yesterdays, which she wrote in the last months of her life, Isabella did not mention Frances at all. And after Isabella was badly injured in a fall, it was her daughter-in-law Barbara Hitt Alden who took care of her, not Frances. 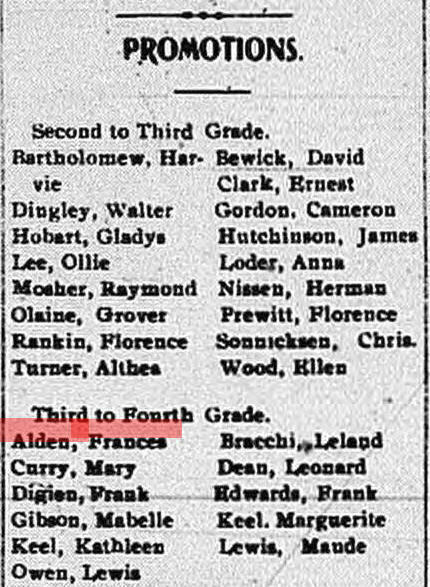 When Raymond Alden passed away in 1924, Frances’ name was not mentioned in his obituary as a surviving family member. The same was true when Isabella and Ross died; Frances’ name was not listed in their obituaries. Isabella built her career and her reputation on her love for children and her desire to lead young lives to Christ. With this in mind, her experience with Frances had to be among the most difficult and painful events in her life. 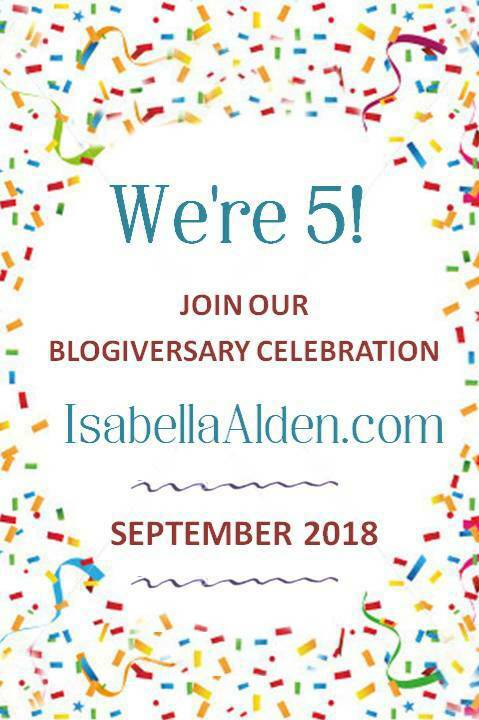 Perhaps, in one of Isabella’s books, there is a character like Frances with a mother like Isabella, whose stories end with a happily ever after.